When I started my business five years ago my first instinct was to buy as many books as possible to tell me how to do it. I am a reader and a learner and this is what I do when I start something new. I feel safe when I have books around me; like the answers I’m looking for are right there in the same room as me waiting to be digested and actioned. That said, most of the business books I read when starting out were either way too generic for the niche set-up I was trying to carve out, or completely overwhelming in their insistence on rigidly-structured business plans and large-scale funding. That was until a beautiful friend of mine with a background in social enterprise recommended I read Start Something That Matters. 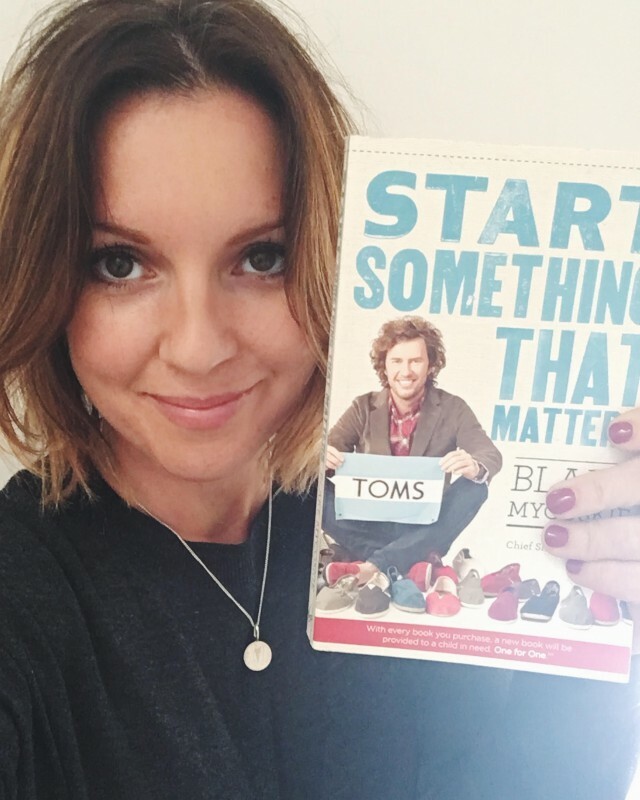 This book, written by the Founder of TOMS Shoes, Blake Mycoskie, was a complete game-changer for me and has been fundamental in how I’ve structured my livelihood and define the success of it. When I first opened this book I must have read that passage about ten times. Its offering of humanity and spirit was what stood it apart from every other business book I’d encountered, and the feeling behind the words resonated with everything I envisaged my own business (and life, relationships etc) becoming. As a mother and an ambitious entrepreneur, I have always known I didn’t want my life split into fragments of work and home, but rather a coherent and fulfilling existence involving a present undertaking of both. Page by page, this book carries on redefining one’s relationship with personal and professional success, bringing them together and encouraging the reader to look within for meaning and motivation. It moves away from the formulaic guidelines of large corporations and strives to put human experience at the heart of business plans and social change. Contrasting the extremes of large (and financially lucrative) private companies with charity projects or underfunded welfare organisations, it offers insight into the middle ground of for-profit businesses that can make a valuable contribution to society in the process, and that can be set up by anyone with a bit of passion and drive. Blake proudly and openly shares the story of TOMS (essentially for every pair of shoes they sell, they give a pair to a child in need), which started with very little funding but a strong vision and commitment for creating a business that offered a consumer product (and income stream) whilst generating charitable support for children in less developed parts of the world. He demonstrates that if you keep telling your story, the word spreads, people hear and things move. Above all, it inspires us to keep things simple in a hectic world, something that in my eyes can only help the life of a mother, entrepreneur and life-liver. Thanks Hollie, we’ll check it out! Hollie de Cruz is a birth and motherhood educator and a pioneer for social change amongst women. She is the founder of London Hypnobirthing and the creator of YESMUM positive affirmation cards, and lives in South London with her husband and son, Oscar.